Beautiful Home In High Demand North East Ajax Features Hardwood Floors & Endless Natural Light Throughout. Kitchen Includes Brand New Quartz Counters, Backsplash And W/O To Private Fully Fenced Backyard W/ Patio. Master Bedroom Includes 4 Piece En-Suite & Spacious Walk-In Closet. Professionally Finished Basement W/ Open Concept Layout, Expansive Rec Room & Pot Lights. 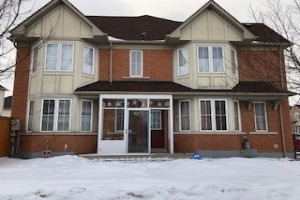 Family Friendly Neighbourhood Mins To Schools, Parks, Restaurants, & The Audley Rec Centre! Extras: S/S Stove, S/S Fridge, S/S Dishwasher, Washer & Dryer. Upgraded Light Fixtures, Quartz Counters (2019). Garage Door Entrance To Home. No Survey On File.